This ain’t your father’s Dopp Kit, you say? It may not be, but it represents the quality and attention to detail of another time. This bag is carefully made by hand in San Francisco from distressed full-grain leather with a water-resistant woven lining and meticulous stitching throughout. 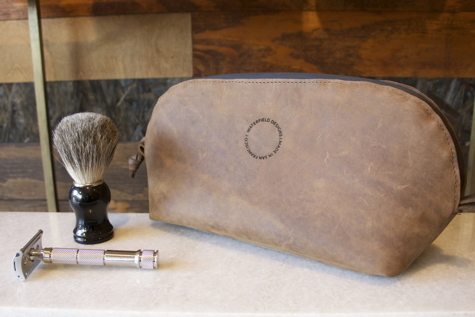 A quality Dopp Kit is the quintessential manly accessory. It is an object that separates men’s shaving kits from women’s cosmetics cases. The Curo Dopp Kit is roomy enough for shaving gear, toothbrush and toothpaste, deodorant, some hair and skin product, and a few other essentials without excessive bulkiness. It measures 11 inches (28cm) by 5 inches (13cm) by 6 inches (15cm) height. The interior lining is a bright golden jacquard fabric. Small objects are easy to find. There are two interior pockets along each side. If you travel with a couple of bulkier items such as an electric toothbrush or hair brush, don’t worry, they’ll fit. The soft but sturdy leather flexes enough so that everything is secure. The luxurious full-grain letter has a sueded finish that will develop its own character over time. It is strong and will withstand the indignities of scuffs, scratches, and the occasional TSA snoop. I expect this bag to grow and age with me. 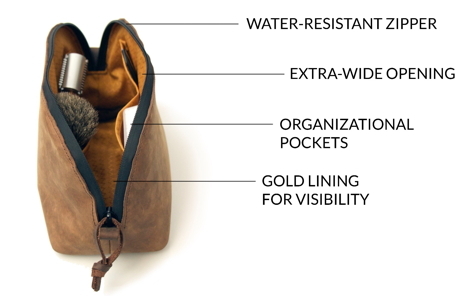 If you are considering the perfect Father’s Day gift for a deserving man (or yourself), look no further than a WaterField Curo Dopp Kit.